Quickly and easily get all the info you need with Pokebuddy! This app lets you search the Pokedex to reference stats and type effectiveness for Omega Ruby and Alpha Sapphire! 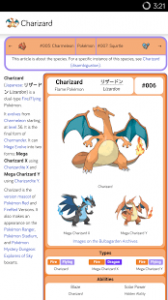 For everything else, each Pokemon’s Bulbapedia page is just a swipe away! Pokebuddy also includes a Type Effectiveness Calculator, allowing users to quickly enter in types to reference effectiveness in the heat of battle! Finally, what Pokedex app would be complete without an EV / IV Calculator? I built this tool for my friends and I to use, because I love Pokemon and the people I play it with. I’m always looking for tips and suggestions, so be sure to send me an email or review if you have any. I hope you all enjoy Pokebuddy!